Last year’s People’s Choice Awards winner was The LinCAN Logs by the ABC Metro Washington Student Chapter (MC SCA). (Washington Architectural Foundation). 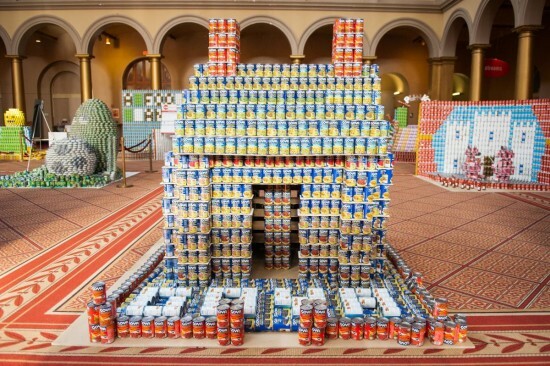 On Sunday, November 22, twenty four teams from architecture and design firms in Washington, D.C. built sculptures out of canned food inside the National Building Museum. The theme this year is transportation and sculptures included the Scooby Doo Mystery Machine, a full-size smart car, a Mayflower bean soup ship, CAN-nook Chopper to the Rescue, a Lunar module, and more. Canstruction is a national food drive for the Capital Area Food Bank. Last year, Canstruction teams donated 56,000 pounds of food and $18,000—the equivalent of 42,000 meals. More than 275 tons of food has been donated through CanstructionDC since the event began in 1998. The sculptures will be on display until Monday, November 30, and visitors can vote for their favorite to win the “People’s Choice Award” by donating a can of food in the “ballot box” next to each sculpture. For those who can’t make it to D.C. (or who want to see more) Work Zone Cam created a time-lapse video for the event. To get completely up to speed on National Building events, check out The Beach by Snarkitecture from this past summer and The Maze by BIG, both in the National Building’s great hall. To learn about Canstruction in your area, check out this website. BIG-Bjarke Ingels Group CANstruction Museums National Building Museum Snarkitecture Washington, D.C.